Aim for the 35 bonus by filling the upper section with at least 63 points near the beginning of the game. For this, concentrate on obtaining as many fives and sixes as possible. Balance scoring between the upper and lower sections to maximize your score. Leave your chance roll until later in the game when your options are more limited. 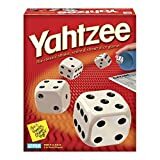 When you roll a bad combination which gives you a low score, fill in a zero in the aces box (near the beginning) or yahtzee box (near the end). Never use 1's or 2's to score a 3 or 4 of a kind because they don't offer many points. Keep them for the 1's and 2's boxes or else for getting a full house. It's not good to go for the straights too early. If you roll four of a kind with 4's, 5's, or 6's, then choose to score points in the upper section because it will help you to get the 35 points bonus. 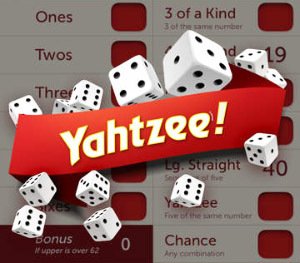 On average, you score a Yahtzee every 22 rolls. 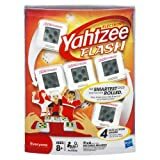 So, every time you have easonable shot at a Yahtzee, you should take it. And also when you already scored one because a second Yathzee will give you 100 bonus points. Go for a large straight when you roll a small straight. Avoid using chance if your score is lower than 25. An exception is when you will loose bonus points if you don't go for chance. Full houses seem to come easily when you're not aiming for them and hard when you roll intentionally to get them.